Overall view of the hydrogen inlet manifold. 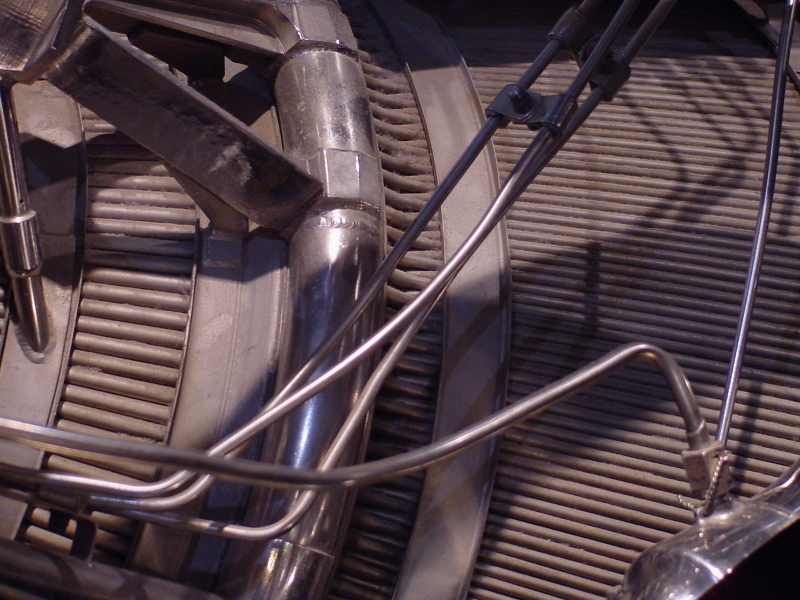 Liquid hydrogen from the turbopump is routed to this inlet manifold, where it travels down the regenerative cooling tubes to the turnaround manifold and back up to the exit manifold. The RL-10 thrust chamber is constructed of 180 full-length tubes running from the exit manifold to the turnaround manifold, plus an additional 180 tubes running from the inlet manifold to the turnaround manifold. This "pass-and-a-half" construction increases the number of tubes comprising the thrust chamber as the diameter of the nozzle increases, allowing for a high expansion ratio.